When MGM released The Pink Panther Film Collection in 2004, fans of Peter Sellers as Inspector Clouseau were confused why it was missing The Return of the Pink Panther. This ommission continued over several other collections that included entries from Alan Arkin and Steve Martin. What was the mystery here? Turns out that the Clouseau “comeback” film wasn’t produced by United Artists. The studio declined the role since they thought Sellers and director Blake Edwards were washed up. What are the odds these duos would have a hit ITV made the film and controlled its home video rights which originally meant fans had to buy a DVD from Artisan that looked like it was mastered from an EP speed VHS tape. Universal would put out a better transfer in 2006. But this drove fans that wanted to have a single boxset on the shelf buggy. Now after all these years, Shout! Factory is releasing The Pink Panther Film Collection Starring Peter Sellers which doesn’t merely unite Return with the rest of Sellers’ Clouseau, but upgrades them to Blu-ray. This is great since only the original Pink Panther was available in Blu-ray. Along with The Return of the Pink Panther,the boxset includes The Pink Panther, A Shot In the Dark, The Pink Panther Strikers Again, Revenge of the Pink Panther and Trail of the Pink Panther. The last entry was made after Peter Sellers died and include numerous deleted scenes from the movies. Think of it as a bonus feature and you will enjoy it better. There is no news yet about the bonus features that will be included. Since this is part of Shout Select, except numerous features. 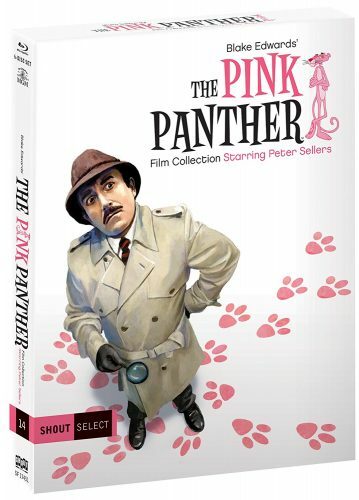 The Pink Panther Film Collection Starring Peter Sellers is slated for release on April 11.